Begin on the Rincon Wilderness Trail, which provides access to the Italian Springs Trail, and then goes to the top of the Rincon Mountains. The first 1.6 miles of the Rincon Wilderness Trail passes through grasslands sprinkled with mesquite trees. At the end of this section, a faint path comes in from the left. This side path leads a short distance to the Park Tank. The Italian Spring Trail continues to the right. After going through rolling hills with mesquites, oaks, and junipers, the trail crosses a streambed which fills with water during summer monsoons and which may have water during the winter. The trail narrows here and begins to climb into an area of large rock formations, pine trees and alligator junipers. After the trail enters the Saguaro National Park, it climbs steeply and ponderosa pines begin to appear. The trail continues through a burn area which has filled in with thick brush. Italian Spring Trail ends at the spring which is also the junction with the North Slope Trail. 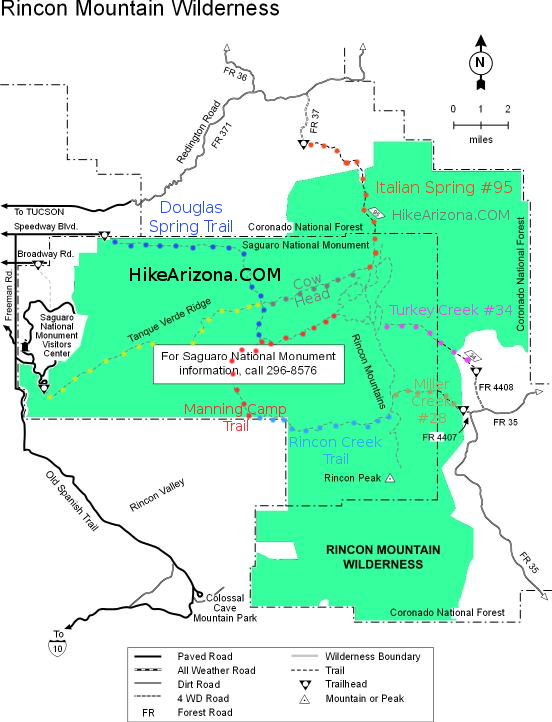 The Italian Spring Trail is a part of the Arizona Trail system. 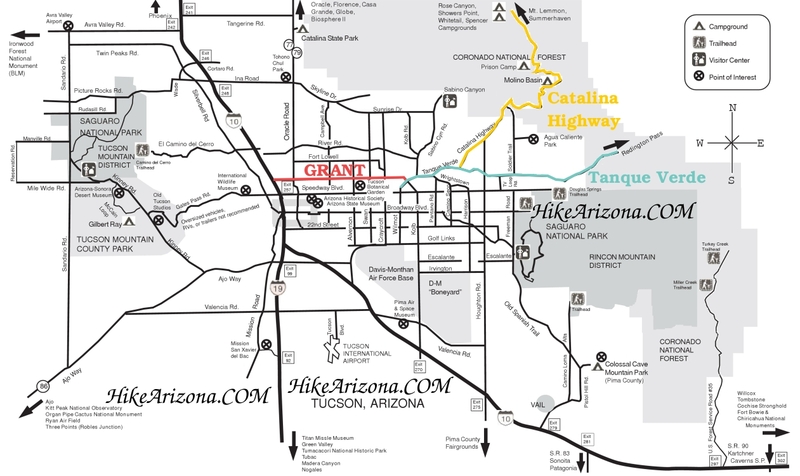 Rolling grasslands, stands of ponderosa pine, alligator junipers, and oaks, access to Saguaro National Park, an Arizona Trail segment and access to North Slope Trail. Access to the trailhead requires a four-wheel drive vehicle. From Tucson, drive east on Tanque Verde Road until it becomes Redington Pass Road, a gravel road. Travel 9.6 miles from the beginning of the gravel to FR 37. After about a half mile, the road appears to fork - stay to the left. At the junction of FR 4424 and FR 37, bear left and take FR 37. At the barbed wire flexible gate, bear left when the road seems to fork after going through the gate. A short while later the road drops into the bottom of a sandy wash. The trailhead is on the opposite bank of the wash.